"If I lived 930 years as Methusela . . ." mused Bill Juhnke on April 25, 1984, 3:15 p.m. in his room at St. Francis hospital in Wichita. But Bill was not Methusela. His heart was giving out. He wrote, "I would rather transmit my thoughts at age 72 even facing heart surgery than from the grave or from a future 800+ years hence." The result was ten pages of diary-style observations and reporting, written in Bill's strong hand with a ball point pen pressed hard onto the paper. Two days later he underwent heart surgery, followed by complications that slowed his mental and physical functioning for the remaining seven years of his life. Meta, as promised in their wedding vows, remained at his side throughout, "in sickness and in health." Bill's hospital diary, as his earlier writing at emotionally charged moments, revealed again that it was not easy for him to express affection or to engage in serious reflection about the meaning of life and death. He was more inclined to humor. When a nurse leaving his room asked if he needed anything, he said, "I was ready for . . . maybe a shot of whiskey which I don't usually drink." The nurse left with a smile, saying "If you find some, let me know and I'll join you." He had brought along three books to the hospital: One was a book of quotations from his daughter, Janet. One was Come to the Party, by Karl Olsson, a gift from his daughter-in-law, Anna. The third was Anatomy of An Illness by Norman Cousins. Bill chose to read the book about life, Come to the Party, which he described as "an invitation to a freer life style. He is Evangelical Covenant. The first 25 p. appeal." From his hospital bed, Bill wrote a four-page letter to a member of his Sunday School class at the Eden Church summarizing the class's discussion of questions from the Western District Conference Ministerial Committee. He visited with a goodly number of family and friends who came to his room or called by telephone, including his pastor, Walter Neufeld. He read the daily newspaper, approving a "terrific column" by journalist Tom Wicker about President Ronald Reagan's "overkill in Central America." Meta, who was reading Newsweek magazine, cut out a story on the scientist peace advocate, Linus Pauling. Bill commented, "There is so much good sense but people want nonsense." Bill's surgery on April 27 was a quadruple bypass. After the surgery he was exceptionally restless. The pain medication seemed to make him agitated. A brain scan revealed, as Meta recorded, "that he had indeed had a light stroke, perhaps even a previous one." His sternum did not heal properly, and, on May 10, he underwent a second surgery. Recovery was slow, but Bill was able to go home from the hospital on May 23. In the succeeding weeks and months, despite gradual improvement, it became clear that Bill had sustained permanent damage. Those closest to Bill saw his personality changed. He refused to admit that he had had a stroke, or to allow anyone else to talk about it. He was more prone to angry outbursts and to paranoid accusations about other people. Worried about what Bill might do on an irrational impulse, Jim took the rifle from the farm to his home in North Newton. Jim was free in the summer of 1984 from his teaching job at Bethel College to take more responsibility for his father and for the upcoming wheat harvest. Realizing that Bill would not be a safe driver, Jim, with Meta's approval, took away the keys to Bill and Meta's car. Bill threatened to see an attorney to get the keys back. In mid-June as the wheat harvest approached and the wheat combine was in the yard, Jim unfortunately left the keys in the combine. Bill managed to get into the combine cab, start the machine, drive into the wheat field near the house, and thresh some twenty bushels of unripe wheat so green that the augur could not turn it out of the bin. The wheat had to be thrown away. Meta and Jim reprimanded Bill. But Bill could not restrain his grinning delight that he had proved that he had recovered sufficiently from his surgery to be the first farmer in the neighborhood to thresh some wheat that year. Jim confiscated the combine keys. Eventually a good crop of wheat was harvested. On July 9 Meta took Bill to Wichita for a physical checkup. The doctor reported that "Bill has done well for as rough a time as he had but he shouldn't try to do as much as he did when he was young." As he gradually became stronger, Bill ignored the doctor's advice. In late July he was out on the field with tractor and plow turning under the wheat stubble. On August 12, he agreed, to Meta's alarm, to preside at an Eden church congregation meeting. In her diary Meta recorded with evident relief that he had done "ok." Moreover, two Eden Sunday School classes elected Bill to be their teacher. He started teaching on August 26. When Jim later thanked one of the Sunday School class members for their patience with a teacher who had impaired speaking and thinking abilities, the class member said, "Bill is still a better teacher than the alternatives we have." Apparently Bill was regaining his old trademark ability to ask interesting and provocative questions. The car was a major symbol of autonomy. Jim wanted Bill to take and pass a driver's test with Kansas Department of Transportation, but that agency said they had no way to withdraw a license from someone who still had a valid driver's license. Finally, after a couple of driving "lessons" with his father, Jim returned the car keys, though he remained unconvinced that Bill was a safe driver. As it turned out, Bill did not have any major car accidents. He did manage repeatedly to scrape the side of car on the garage entry way, both at the house by Elyria and later, after they moved to Moundridge, the garage door sides at their Memorial Home apartment. Bill also struggled to regain mastery of his typewriter. Within two years he was typing letters to his children reasonably well. Although Bill was reluctant to give up farming entirely, he did reduce his farm operations. Bill and Meta arranged for Floyd Gehring, auctioneer and fellow member at Eden, to take thirteen of their cattle to Hutchinson for sale. Meta recorded that the cattle were sold for a little over five thousand dollars. In the fall of 1984, the "Unraus," a family corporation led by Vance (Candy's husband) Unrau's brothers, harvested the milo. Bill continued to farm the land adjacent to the original homestead, but the Unrau corporation rented the other two hundred acres. Bill continued to enjoy his reduced farm operation. In 1986 he reported in a letter to Sharon that the wheat had yielded from forty to fifty bushels per acre, "and I got it all plowed in June for the first time in my life." In August 1984 Bill and Meta "recorded the deeds" for their children to receive an inheritance of forty acres each. Ruth's part in the inheritance remained in limbo, however, as Bill and Meta were worried that it would end up as property of the Divine Light Mission, where Ruth had taken a vow of poverty, chastity and obedience. Also, Bill hesitated because the forty acres available for Ruth, south of the old house, was bisected by highway #81 and therefore not an equal share. Eventually, after Bill died, Ruth received a full cash equivalent of forty acres from the estate. She had left the Divine Light Mission and was living in Kansas City. She invested the inheritance money in a house for herself there. Bill would have been proud of his daughter's investment. Despite advancing age and health problems, Meta and Bill were able to host guests in their home by Elyria. On January 20, 1985, for example, Jim brought eighteen members of his history class for Sunday dinner--after they had attended early Catholic mass in Newton and a morning Holdeman Mennonite worship service. Meta and Bill eagerly got information from their guests, especially delighting in foreign students and in grandchildren of their friends. After dinner on such occasions, Meta would get out her quilts to show the group. Bill turned the conversation to politics and the state of the world. 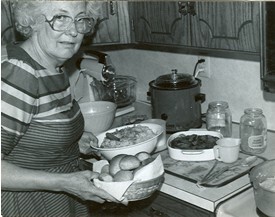 Meta prepares the Thanksgiving feast, 1984. One point of minor contention in the Juhnke family had to do with the eroding moral code that forbade, among other special farm activities, the harvesting of wheat on Sunday. To the dismay of Meta and other family members, Bill was powerfully tempted to trespass a rule that he had observed all of his life. Perhaps his moral controls had been affected by his stroke. On July 16, 1985, Jim wrote in a family letter, "It is hard on Dad that so many others (esp. the Unraus) are cutting wheat on Sunday. He threatened to go out with the combine this afternoon--but all the rest of us protested. The forecast is for good weather, the wheat is still a little green, and they don't need the money desperately, besides which the Lord set aside the Sabbath for rest." But Jim also had to admit that on Sunday afternoon he had unloaded a pickup full of manure from the farm on his compost pile in North Newton, and asked Joanne to harvest beans from the garden. Meta and Bill Juhnke at their 50th wedding anniversary, June 7, 1987. 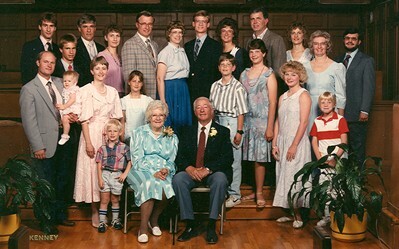 On Sunday June 7, 1987, Bill and Meta's six children hosted a 50th wedding anniversary celebration for their parents at the Eden Mennonite Church. They served about a hundred people for lunch, mostly Bill and Meta's brothers and sisters ("geschwister," wrote Meta in her diary, showing her preference for German words that were more efficient than their English equivalents) and their families. Relatives came from California, Colorado, Arizona and Florida. For the two o'clock afternoon program the six children gave a readers theater presentation of family memories and tributes. Meta's sisters Mary Ann and Marjorie had "engineered" the making of a surprise quilt. Bill and Meta shook the hands of some three hundred people who attended the afternoon reception. Afterwards the primary family went to the Elyria home for more conversation, games and leftovers. It was, Meta said, a "Great day!" Bill and Meta family at the 50th wedding anniversary, June 7, 1987. Richard Schrag: "I always considered Bill as being quite daring. . . . (In one speech he said) 'The weather is so dry and times are so tough that the farmers can't even raise a corn cob to wipe the (pause) sweat off their brow.'" Elizabeth Goering: "Visiting with you has always been comfortable, interesting, and most certainly delightful--no matter what the subject matter: us local Democrats, national politics, theology, Anabaptist history, . . . ."
Herbert C. Stucky: "We were especially interested in William Juhnke's writings in the Moundridge Journal about the School Districts and Teachers and surrounding Communities." Elda Waltner: "It used to be only old people celebrated a golden anniversary. Now it happens to young couples as well." Edna Goering Kaufman: "You (Bill) were a super actor but not always the easiest to follow with the script. You did a lot of ad-libbing and the clue line wasn't always the same. I believe it was in our first play, Yimmie Yohnson's Yob where one time you weren't sure of your lines and for an excuse to get off the stage you looked out the window and said, 'Oh, the pigs are out. I must get them back.' And out you went." Verna Flickinger: "When Meta and I were teenagers we walked upstairs to Sunday School class and she was several steps in front of me and more girls, and one of my girlfriends whispered to me, 'Meta's face is so pretty it reminds me of an angel.'" Emma Stucky: "Meta it was always a pleasure working besides you in Ladies Aid. . . . You taught me such a valuable hint--marking quilt blocks with a sliver of soap and I've been doing it ever since." 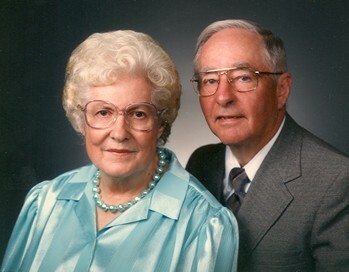 Alvin and Marie Schrag: "You are a great Sunday School teacher and I enjoyed being in your class. Both of us enjoyed you the year you taught Mennonite History at Eden." Ed R. Stucky: "I recall that Model A car Bill had with a rumble seat. This was very useful in courting one of the brightest students in Moundridge High School." George Buhr: "Our family enjoyed many hours in your comfortable (Lehigh) home, and w remember that most visits included a treat of hot, delicious popcorn which Jim popped up." Mrs. Lester Goering: "Bill has been a history buff from way back. As I remember in grade school Willie, as Bill was called then, spent a whole recess with the teacher on their history lesson that they had that day. If I remember right the teacher was Arnold Stucky and Bill was in the 7th grade." Jean Hassman: "When you, Bill and Meta, became Democrats, you might have gone against some family traditions! But after considering the issues, especially those related to peace and justice, you folks became loyal party members who practiced effective teamwork in leading the struggle for those less fortunate than the majority." Walt Neufeld: "You were well read, and continued to work at intellectual and spiritual growth all the time. TV somehow never burned up your minds. You were inquisitive, open, always in search of truth, no matter where it would lead. . . . You were good teachers, good theologians, and supporters of higher Christian education. Above all, you were first and foremost, supporters of the church." Peter Dyck: "Mention the name Juhnke and my mental retrieval system instantly flashes on the screen the Juhnke farm with its Juhnke grove used by Eden for church and Sunday School picnics." Lavina Ediger Goering: "Thank you for all the talents your children shared with us--piano, violin and all the wit from your talented family speakers."